I've added the CAB graph to show that 2018 almost certainly won't be able to keep up with 2012. If there's a cliff of sea ice loss in the ESS, and the 2018 trend line can somewhat keep up with 2016 on the CAB graph, this year's minimum may end up in or close to the top 3. Personally, I think it will be a top 5 position. But this, as always, will also depend on the weather. Thank you for another great update Neven! And yes; it will be very interesting to observe the next couple of weeks - the heat brought from Laptev due to the combined low and high in Siberia definitely scorched the ice on that side for some days. Seems like the bland weather now allows a slight cooling in the highest north. If there's a cliff of sea ice loss in the ESS, and the 2018 trend line can somewhat keep up with 2016 on the CAB graph, this year's minimum may end up in or close to the top 3. Personally, I think it will be a top 5 position. Following the 2005 to 2017 average rate of change between August 15 and the minimum, the extent is projected to drop to an annual low of 4.55 million square kilometers (1.76 million square miles), with a standard deviation range of 4.32 to 4.78 million square kilometers (1.67 to 1.85 million square miles). If sea ice extent continues at the rate of ice loss seen in 2008, the fastest recorded, the minimum at the end of summer would be 4.20 million square kilometers (1.62 million square miles), or the fourth lowest minimum in the satellite record. If sea ice extent continues with the rate for ice loss from 2006, the slowest recorded, the minimum would be 4.90 million square kilometers (1.89 million square miles), or the ninth lowest in the satellite record. We will see what the remaining weeks have in store, but considering that ice concentration is still anomalously high, and temps are already starting to drop below freezing, I expect a bit of a stall in the weeks ahead. And thus I expect a finish closer to the high end (4.9, and ninth place) than to to low end (4.2, and fourth place) of NSIDC's assessment. the simple geophysical explanation is as follows: sea ice Central Arctic Basin sea ice pack is lighter, still with ridging and older sea ice which gather traction with the winds. Furthermore it is excessively difficult to assess all this given JAXA map being out of service and excessive cloud coverage, fluidity means vast scattering of thousands of small ice islands , when winds change direction , the melt appears to stall, so it is very improbable to make exact assessment of minima extent without these vital bits of info. I agree with your assessment in large and expect the minimum NSIDC SIE to reach 4.5 - 4.8 MKM2 - or even 4.9 if little compaction will take place. If so, the Sept average extent that we have been projecting for, should be within assessed range, where I had listed 4.85 - 5.35 back on June 8th. From Tropical Tidbits it seems like considerable amounts of warm moisture is moving up fast through the Atlantic and converging into a massive cyclone about a week from now. The forecast could still change, but if this will occur, it would be the worst time possible with sea ice at minimum and SST at maximum. A lot of slush in the making it appears - and possibly a 'GAC2018'.. I declare 2018 to be a fully recovered year thanks to the sea ice graphs page. What could possibly happen from here? Any news on that potential GAC2018?? Since you ask. Possibly there'll be some significant swell! Wayne, what exactly do you mean by the last comment in your last post? The arctic sea ice looks like Antarctica? So, Wayne, if you are saying the poles are looking remarkably similar then what is your cryptic point? Their conditions are so dissimilar that any visual comparison must be carefully interpreted! Sure, graphical trends are trends but are you perhaps saying there was a trend toward this more direct visual similarity or what exactly are you trying to say? drphilosopher's question is right, like clouds we can visualize meaning in sea ice shapes, some wind swept bergy bits may look like a polar bear. Nautical miles North. This was never seen in the lifespan of the remote sensing era. Now, I don't think that we will end up with 5.19 M km^2 for the NSIDC September average, but we may get pretty close. Before June, RD, you were asked what your prediction was for the 2018 melt season and you replied you would have the necessary information for that prediction in early June. On 6/6, your prediction was 4.84, then after some posts by Wayne you adjusted it down to 4.5. Then in July you raised it to 5.19. If your formula has the necessary inputs to determine a prediction in early June, then that's your prediction and it remains at 4.5. That 6/6 prediction was based on May data, and my method does not work very well there yet. It's only sightly better than a simple linear decline. It had to be adjusted since NSIDC changed the way they calculate the monthly averages of area and extent. The July prediction (using June data) of 5.19 is much better with 380 k km^2 standard deviation over the residuals. That is decent but still not very accurate. So overall, I'm still not happy with this method, and I'm looking for ways to improve it. This will be the second year in a row that I'm predicting too high, and both years the preceding winter was very warm, which suggest that the ice was thinner than 'average'. Still looking for ways to incorporate ice thickness into the method to see if that improves the accuracy of the prediction. In short : It's a work in progress. I understand, DK. That said, you have been very close two consecutive seasons, at least by my standards. Good luck on adjustments to the formula. Yes; as we enter September we will see how the predictions meet with reality. Based on the recent slowdown and unless extreme weather sets in, I would think Rob's prediction of 5.18 with the gut feeling that this should be the high end, will be quite close. I entered 4.85 - 5.35 on June 6th and still have good faith that the Sept NSIDC avg. SIE will be found in this range. John - Does this count as "extreme weather"? All the seas between Greenland and the New Siberian Islands are awash with swells with a period of 8 second or greater. This is most unusual, to put it mildly! Yes, I noted this 'GAC2018' also in the forecast back on 8/23. It seems like we have seen the worst and that it will dissipate in the next days. So far, the impact does not seem severe, but agree that due to increased mixing we could see further drops - or more likely that the mixing will retard the onset of freezing of surface waters..
September 2nd, 2018: 4,749,726 km2, an increase of 16,253 km2. 2018 is the 8th lowest on record. It seems the passage has not opened this year - if not that might be a first in this decade? However there are still several significant swells sloshing around north of Russia. 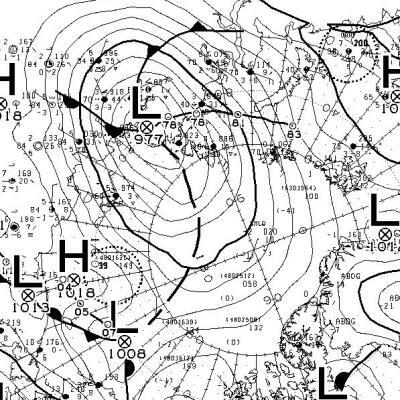 Note the Arctic Low hugs warm open water, feeds on it like a hurricane. clouds with loose pack are joined at the hip, and the ever slight but systemic year by year sea ice thinning continues despite unfavorable weather caused by mainly pervasive summer clouds. All expected of course, now is the course of the damage done, how long till maxima given great air moisture columns, swells to demolish anything and likely record warm sst's? One sailboat seems to have made it safely through the CAA this year. 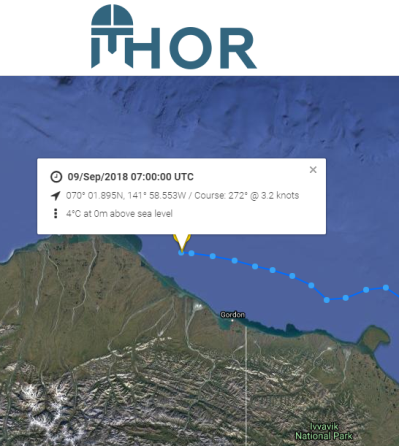 The aptly named Thor? As long as we know that this is happening is OK, but I dare not explain this to the un-initiated! 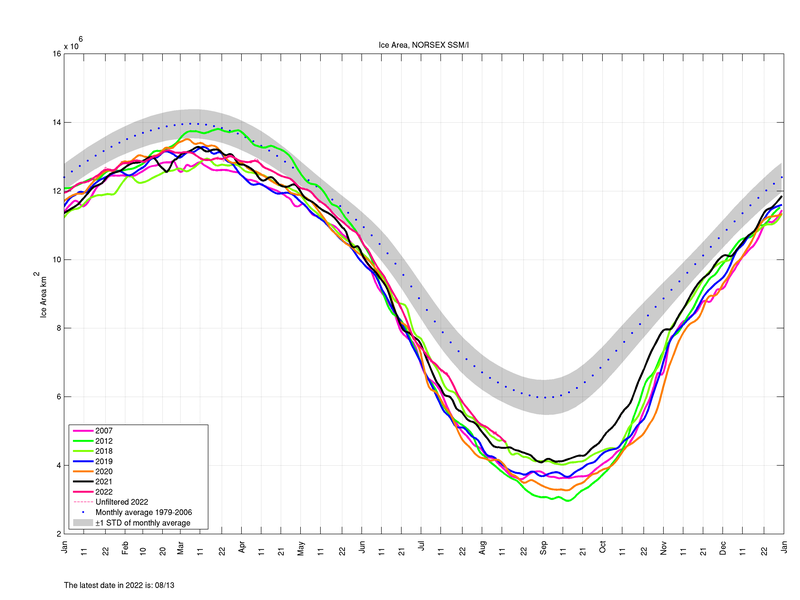 Seems like the sea ice area is about 25% larger than six years ago. Using a standardized metric, with best resolution possible, for maps and numerics would help in analysis tremendously, meantime that 25% figure stands, but how to translate when there is confusion baked in the system? 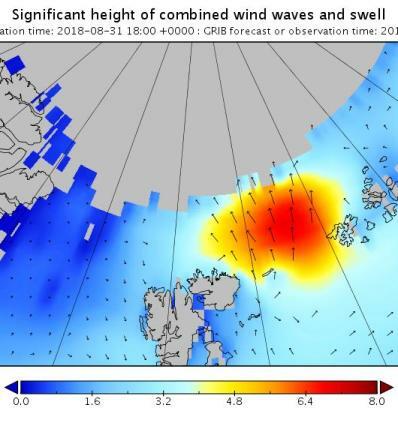 With the 15% rule is a simplified metric, created due to the limited ability to accurately measure sea ice cover by satellite during summer months caused by extensive cloud cover. Calculates sea ice cover with e.g. a measured 50% cover in a grid resulting in 50% counted as covered. This measure provides a number closer to the 'actual' sea ice cover, but is less reliable during sommer months with heavy cloud cover. That said; the cloud cover has now eased, and I prefer using the SIA metric for the non-sommer period, as it provides a number closer to the actual sea ice cover. "With the 15% rule is a simplified metric, "
I see it as an old way of describing sea ice at the perimeter of one huge massive Arctic block, which it was for as long as humans knew about it, convenient to foretell that 15% of sea ice may sink your boat, which it did, but now it is hollowing from within. 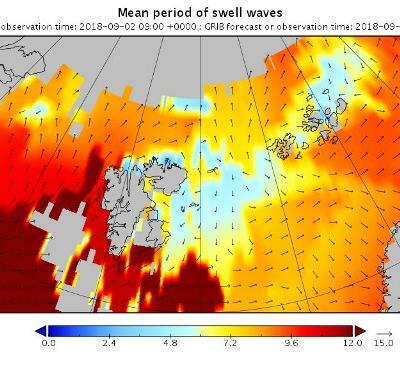 SST's super hot and air is warmish for the Arctic, the only ingredient missing for further dramatic extent reduction is a significant Gyre synergy event of high winds and waves which will occur but partially during next few days. You may not have noticed, but the ROOS sea ice area has been increasing over the past couple of days.. Extent drop during sea ice area increase is consolidation, not melting, and with the sun headed south there is no turning back to significant melting that could bring 2018 anywhere into the vicinity of 2012. Not even by a far stretch of imagination. I have shown ample evidence of melting , and it continues, as said in a dipole fashion, One sector is covered with snow (Atlantic) the other sector has slow methodic melting, where there is some compaction but never gets a chance to get organized as much as it should to be significant, the winds vary too much from day to day.. At present, 2018 morphology looks like 2012, the similarity between the two seasons ends there, 2018 is a mess in fluid ice movement, 2012 (melting and mixing in place) is the culmination of the old thick ice circulation regime which permanently collapsed, less sun radiation during every subsequent summer since:. What is the resolution of this ROOS system? The different last phase change of sea ice indicates melting of different small packs each one of them having a chance to say "goodbye"
Want a whole lot more proof about current melting? Even on the Atlantic side? wayne - when the sea ice area is increasing, then the area of ocean surface covered by sea ice is increasing.. Being mid-September it is quite normal that some melting still takes place at the outer boundary of the ice pack, while smaller lanes and melt ponds are starting to freeze over at the center of the pack. This is why the sea ice area minimum is reached earlier in September than the sea ice extent minimum. This is also how the Arctic sea ice cover typically grows in September to November/Dec until the SST and air temps at the ice pack boundary get low enough to cause in situ freezing at the boundary of the pack. Being situated in the Arctic I am surprised you have not noticed yourself..
Did you read the evidence presented? I am confused by your assertion that minimums occur in September, snot always on the same date, some come later some come earlier, this year is later, may be you did not notice?